"Tender Turtwig" is finally complete! My journey into acrylic painting was yet another exciting ride, especially because it was for all the right reasons. If you hadn't caught my story about why I switched from oil painting to acrylics, please click here to read: "The Spill should Spell CHANGE." The wise and deep eyes of Turtwig and all the beautiful sea turtles I encountered at Loggerhead Marinelife Center in Juno Beach, FL told me thousand of stories, and called to me to present to everyone possible the connection these incredible creatures have to our daily lives. We forget, we take for granted, and we continue to destroy the very resources that give us LIFE! We do not have life without our oceans, period. My friends at LMC consider sea turtles the "Ambassadors of the Ocean," and I cannot think of a better way to express what sea turtles represent. They are timeless. They, like frogs, date back to prehistoric times, they have seen so much more than we can image, they as adults have earned every wrinkle, and they are vital to our oceanic ecosystems - which in turn give us what we need to live here on earth. Sea turtle adults are literally 1 in 1,000 - meaning the other 999 baby turtles are a food source that feeds the oceans, which in turn feed us. This also means that each 1 in 1,000 that makes it into adulthood is even more vital to carry on the huge role these gorgeous animals have in the circle of life. When I have the privilege of being near a sea turtle (or any creature for that matter), and experience their unique personality, their "essence," each one tells me their own story with their eyes. I believe we all tend to miss this in our busy routines - so I am striving to portray through my art what each one is saying to us. Hoping people will listen, begin to care, and simply take small steps to begin sensible changes in daily their routines. (Like stop using plastic bags, use less energy, drive a little less, use eco-friendly materials, etc.). This mission has begun in a large way already, thanks to Sylvia Earle,founder of Mission-Blue.org, author of The World is Blue : How Our Fate and the Ocean's Are One. So, when I made the decision to begin painting with acrylics, my heart poured into the cause, and as the Gulf Oil Spill details, and lack of transparency by many, continued to unfold, so did my anger, my resentment, my determination to do something. It seems many of us have pent up frustration now - and if I can so do something to help some good come out of such a catastrophe...then I must dive in. The actual shift from oil to acrylic is not as easy as it would seem, yet once again, became a wild ride into making mistakes and a journey into the imagination that keeps me hooked on painting. As I went through the normal frustrations that an oil painter goes through when learning to work with fast-drying acrylics ("you have to get it right the first time..." is what I had to keep saying to myself as I kept having to re-work and blend places, that would have easily been fixed with the luxury of slow-dry oils), and the challenge of achieving the depth and contrast of colors that I am known for in my oil (which I persisted in by pushing my color mixing skills as far as I could take them), Turtwig emerged slowly, with each layer became more and more fascinating. Back into the zone, that "doing what you love zone," or, what Sir Ken Robinson calls "The Element." As those tender, chilled-out eyes of Turtwig began to emerge, I knew I made it. I made to the finish line of a small step to do my part for our oceans - for these beautiful creatures. If I can just communicate all of them - from the turtles, the dolphins, the seabirds and more who will soon be showing up onshore covered in oil or sick. If I can only spark interest through the intrigue and mystery of the arts, the awareness of the casualties that are at the bottom of the Gulf that we don't even see - the thousands of fish and coral that have already been destroyed, and now soon perhaps our last live coral reef in the Keys. My heart is breaking - and I am not sure who our there in our country really cares. I am sure it is hard for those up in Michigan, Vermont, Ohio or Kansas to even comprehend what is happening down here - and how it really is going to afffect us all. So, all I can do is continue on my mission, continue expressing my love for the Ambassadors of our Oceans, the Sea Turtles, and more - through OceansForLife.org. This way I can help all the organizations who are working tirelessly to help our oceans heal, and I can somehow begin the campaign that we can all take small steps in our daily lives to help. 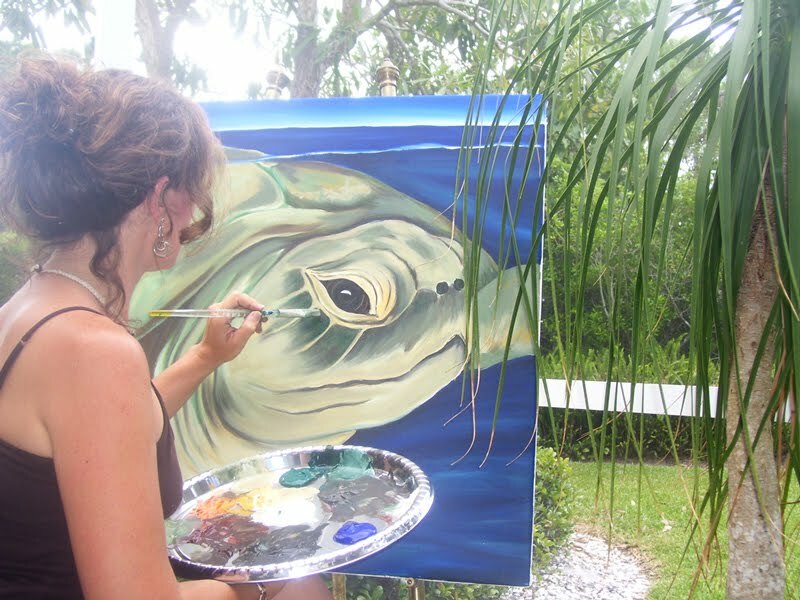 So, "Tender Turtwig" is part of my artistic journey to create art with passionate purpose... like "Knowing Neal" (to the left, myself with my art collector, Kim, donating the original to LMC), and all the other turtle patients at Loggerhead Marinelife Center and soon other organizations who wish to have me portray their causes. (They are encourage to contact me at http://www.oceansforlife.org/) The next phase is to begin the conversation at http://www.oceansforlife.org/ when it is live JUNE 2010 (you can sign up now privately to receive word when it's ready), then portray as many creatures from our oceans that I possible can to drive the message home - and provide a creative way to just begin the message that it's time we all care. PLEASE SPREAD THE WORD ABOUT my mission (OceansforLife.org FACEBOOK PAGE and Site in progress), and consider bringing "Tender Turtwig" home - the original, prints, canvas shopping bags (to start good habits of not using plastic bags that turtles mistake for jellyfish) and more are now at my online gallery/store. 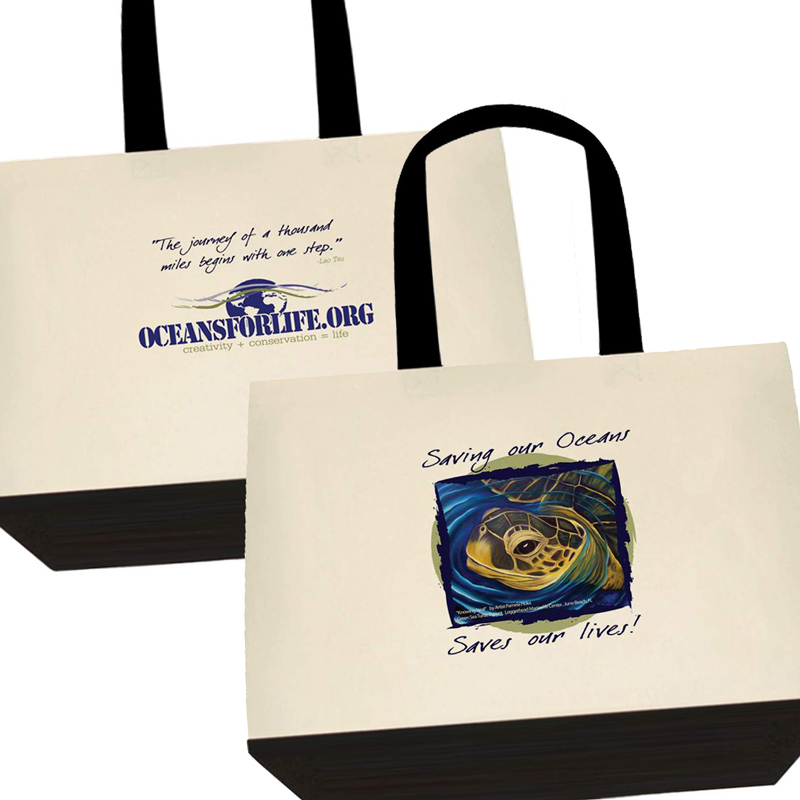 30% goes to helping our oceans (20% to Loggerhead Marinelife Center and 10% to the partnering emergency responding non-profit organizations to the Gulf Oil Spill). THANK YOU FOR YOUR SUPPORT in helping me help our oceans with Art! "Tender Turtwig" ORIGINAL Acrylic on Canvas 32"x32" - $2,250.00. 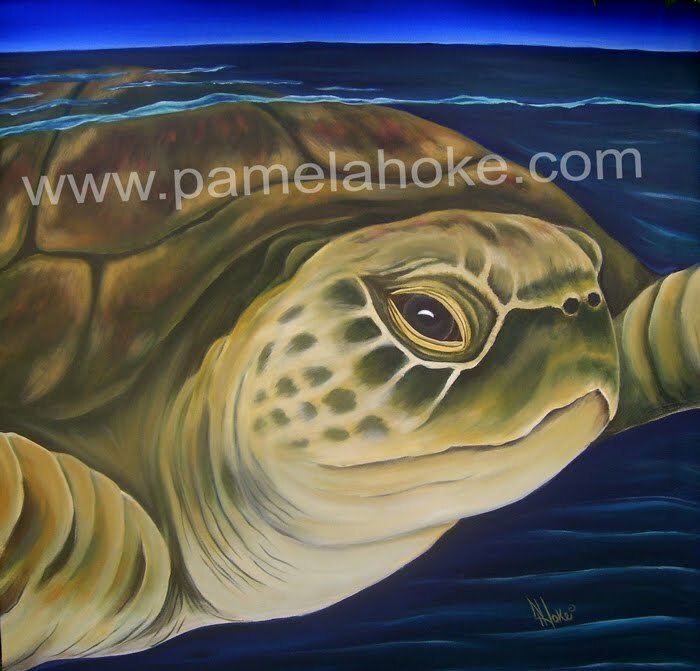 Ready to frame, is ready for the right home: the owner of this 1st ever acrylic piece by Pamela Hoke will also be listed as a primary sponsor for http://www.oceansforlife.org/, and 30% to help LMC and organizations that need assistance during Gulf Oil Spill recovery.